As someone with oily skin, it's hard to find light-weight products that look fresh on my skin through the day. I really wanted to try a cost-effective BB Cream so I chose Rimmel's Skin Perfecting Matte BB Cream. The shade I have is Light. The consistency of this BB cream is pretty thin - much thinner than any foundation or BB cream I've used in the past. I put it on the back of my hand and it will drip if I'm not careful. The thinner consistency really helps this product blends effortlessly on to the skin. It feels light-weight and spreads evenly without looking cakey. I used a synthetic buffing brush for application - I found this gave the most effortless, natural application. In terms of coverage I was pleasantly surprised by this BB cream. My skin was acting up recently and I had some blemishes on my chin. This BB cream covered all the redness on my skin and I didn't find the need to reach for concealer. Such a timesaver! I just used a stippling motion over particular areas that needed the coverage, gently tapping so product was not wiped away. Following application, I treated this product as I would any other base - setting with powder and applying my bronzer, blush and other makeup. I tried it with and without setting powder and still loved the wear and finish. 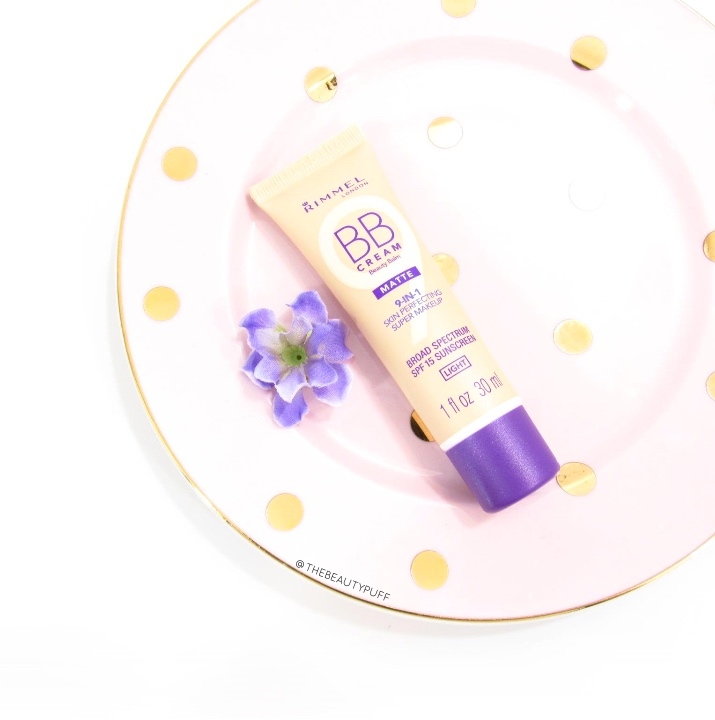 Although this BB cream is advertised as matte, I would consider it more of a natural finish. It certainly wasn't luminous, but it did not give a powder finish as many matte products tend to produce. I actually liked the natural finish, it left my skin looking very fresh and healthy without appearing heavy with makeup. The area I had to blot once during the day was my nose, where my skin is the oiliest. I'm used to that and it doesn't really bother me. I did like how this product held up through the day without getting patchy. If you have particularly oily skin like I do, I suggest using a powder to maximize this product's longevity. Overall, I'm really impressed with this affordable BB cream. You can find it on Beautyspin.com, along with many other Rimmel products. They have fragrances, haircare, makeup and more! Shop below.